There are only those weak enough to believe they are. To be a black magician is perhaps ye most dangerous thing one can attempt, for you risk not only your life and mind but your essence — what simpler minds call ye “soul” — as well. You may beat ye odds and become a god, but most likely you will go mad. Or — and this may be worst of all — you may do both. Oh thou who wrote of evil things remember : they always are inspired by Ye Evil Ones you shall meet after your passing, so turn your dark thoughts to repentment and prayer since ye road to Hell is much shorter than what you believe : do not let you wicked soul to become as dark as this page. We hunt a horror that feeds on human tears . . .
After the western horizon’s blood turns black, and all through the dusky hours, I, in my solitude, roam the far flung realms of time. In ancient halls with brazen censers smoldering, strange shadows dance across vaulted ceilings and curtains of rich velvet. And those stone chambers ring with echoes of the twisted language of conjuration, lighted by the glow of otherworldly powers. The walls meet at impossible angles and there tread unearthly fiends that are deranged nightmares come to life. Frozen by fear, I remain unseen. And ere a tint of rose in the east heralds the coming dawn I am released from my nocturnal wanderings and am allowed to return from whence I came beyond the wall of sleep. Only then do all those things vanish and be gone with the morning mist until my awakening once again gives them life. While traveling from island to island, I heard many tales of ancient and forgotten lore. Although I dismissed many of these stories as nonsensical superstitions, I found ye tale of Orobla singularly significant. It evoked half remembered feelings that I had not felt since I had slept in ye ancient city of many pillared Irem. Such was ye way that Orobla would speak. It had expounded in this incessant manner for hours and days and years unnumbered, always cursing ye reticent nature of its many followers. Until that fortold day when ye moon was as crimson and flaming steel fell from ye stars. Upon that very day, when ye ruddy sphere hung at its apex like a severed head, ye Beast of forgotten lies was silent. Orobla has not uttered a sound since. His priests,who hide amongst ye men and women of Crete, reverently proclaim that when Orobla speaks again ye world shall be undone. 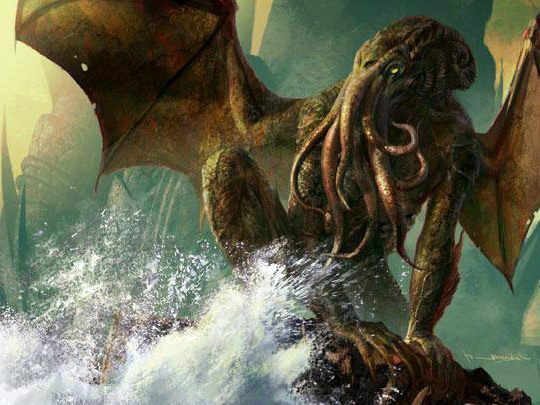 They claim that R’leyh shall be hurled into ye sky and Cthulhu and his kind shall be freed to rule once again. I know not if I should believe all of ye strange tales they told me, but ye previous legend was told with such conviction that I felt compelled to record it. It is still bright, but for how long?.. There is something of heaven in death. I live, I will die, I will leave, I WILL come again. Through the ages I have lived, secluded under the impass- able mountains of the unknown Kaddath, but now having dis- pelled the arcane powers that kept me imprisioned, I have returned, and I am here to wreak fiery death and chaos upon your lowly race. Behold the Power of Axn-Xcamr the all power- ful Keeper of the Yellow Sign, he who is dead yet lives! Nay! Dead Cthulhu lies not dreaming, rather, listen to the rhythm of the waves, for they tell the fell story of a noisome day to come, when Cthulhu shall spew forth from dead R’Lyeh to lead his minions on a rampage of slaughter throughout the unsuspecting world…. Humans are such foolish creatures…. They know not of the Dark, of the Things Within, of Nyarlathotep, Cthulhu, or Shub-Niggaroth. Few of the foolish creatures, Bolder, if less sane than the rest, Choose to learn, to understand. To find the secrets of the Night, to learn that which none should know. There will come a day when they will walk amongst you. They will not be able to be seen for what they are by normal folk. Only those amonst you with true faith will be able to detect their evil and be able to stop them. Do not fail as the fate of the world rests in your hands and as such, if you fail, the human race is doomed. and my dream-dark master calls me to him. Ia! Io! Mine eyes are rent by glorious destruction!